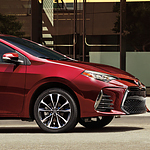 The Toyota Corolla has become a popular compact car in Rockwall. The exterior features are sure to get noticed, showing you how sporty and reliable it is. We’d love to show you the features up close when you stop into Toyota of Rockwall. There’s a sporty front fascia on the Corolla that shows just how aggressive it can be on the roads. You’ll notice the Bi-LED headlights add some style, too. The lights will shine bright and are more energy efficient than many of the other lights being used in the industry. As you look around the Toyota, you’ll also notice that there are available 17-inch alloy wheels to provide a stunning profile. The spokes will enhance the style and performance that the car has to offer. It’s hard not to take notice of the rear spoiler, too, showing off more of the angles.